I don’t think this is true. Or at least, I don’t believe age has anything to do it. Having been a student and facilitator of writing workshops, I’ve encountered writers of all ages who have exceptional story ideas and the ability to learn how to craft their ideas into screenplays. That’s part of the buzz I get from being in the facilitator role; I get to be a part of new writers learning the craft and bringing ideas that otherwise wouldn’t be in the world to the page. What I do think is true about Boudinot’s statement is that a writer must have the passion and discipline to follow through on their ideas, even when they lack the inspiration. They must soldier through even when they hit story blocks, and when they have fallen out of love with their idea. Much like Tinkerbell, if a writer doesn’t believe in writer’s block, then writer’s block ceases to exist. Lawrence Kasdan, writer of Raiders of the Lost Ark and The Empire Strikes Back, once said that “being a writer is like having homework for the rest of your life.” And if a writer is unable to stick to that mantra, they are probably not going to make it. New Zealand-based filmmaker Chaz Harris wrote a blog post on the passion it takes to make movies and describes that passion better than I could summarise it here. For me, reading his post reaffirmed why it is that I write. Part of why I write is that I feel empty doing anything else. And I feel unaccomplished on the days that I don’t write anything. And thinking about the statement that Boudinot made, I do believe that anyone is capable of being a writer. But the flip side of that is that not everyone possesses the drive it takes to be a writer. If you don’t feel like it’s what you were put on this earth to do, you’re probably not going to make it. When someone says, “I’m going to keep chasing my dream because it’s my dream and I believe in it and I know that it’s what I’m supposed to do,” what I hear is “I’m entitled to this. I’m entitled to it. I’m just going to keep chasing because I’m supposed to have it.” …You’re not supposed to have anything. You get what you earn. And there are remarkable stories of people with extraordinary talent who squander it because they’re just waiting for somebody to give them something. Being a writer, and getting to a level where someone will pay you to do it, is about hard work. You’ll have to be doing it for the love of it. In my time as a writer, I’ve discovered that there are two types of writers. There are writers who focus completely on one ‘passion project’ and write it through to completion. And then there are writers who have several projects on the go at one time and depending on a number of external factors, they’ll be flexible about the projects they focus on. I tend to fall into the latter category. I’m not saying one path is stronger than the other. Working on your opus and completely committing yourself to one project for months/years at a time will probably yield great results. You’ll certainly have an unparalleled level of passion about what you’re writing. I do however think that if you want to sustain yourself as a freelance writer, you should be flexible enough to work on a number of different things at once. Not all projects are going to succeed, and not all projects are going to be paid upfront or lead to a payday. In an industry so small, we should not put all of our eggs in one basket for an extended period of time. In the words of Neil Gaiman, we should become dandelions. In his keynote speech at the 2013 London Book Fair, Gaiman talked about a need for this kind of flexibility in relation to a rise in piracy, ebooks, self-publishing, and other elements of the digital age. But the below quote also relates to working on one passion project at a time vs. being flexible and writing multiple. Mammals, which all of us are, I hope, put a tremendous amount of effort into raising our children, into what we do. Child – it’s, you know, a solid 15, 16, 17, 18 years. They go onto higher education. It could be 22, 23 years, and you’re still raising these things. And you put effort and you put life into it. Dandelions don’t care. They just have thousands of seeds, and they throw them to the wind. And there’s a level in which, as time goes on, I’m enjoying throwing things to the wind. We should be flexible within the demands of our anticipated audience and collaborators. And while keeping within the framework of telling stories we want/need to tell, we should be strategists and tacticians about our writing careers. If one project fails, we should be able to shed it or put it on the back burner because we’re already leap frogging to the next one. Working writers trade in intellectual property, and should have hundreds of equally great ideas up their sleeves. And they should also have ideas for how to approach ideas that are not their own. I have a couple of projects on the go at the moment, some of which are my own ideas and some of which are ideas that others have come up with that I am either writing, rewriting, or script editing on. I am able to meet deadlines (both self and externally imposed) by being very regimented with my time-management and organisation. I allocate hours and days to specific projects and then change gears and work on the next project. Each project I’m working on is one that I am passionate about. I’ve followed Joss Whedon’s advice and only taken on projects I love. And the way that I am able to transition my focus from one project to another is by looking at quotes I’ve written about each project. When I first come up with an idea, or when I first take on a project, I find the aspect of the project that I am most excited and passionate about. More often than not, this is the project’s theme, but it can also be a smart premise. It’s always something that makes me emotionally connect to the project. 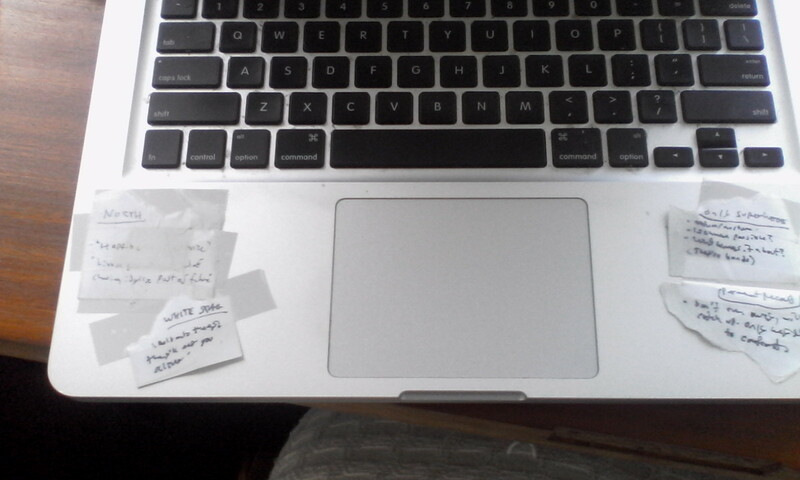 And whatever that is, I’ll write it down as concisely as possible at tape the quote to my laptop. That way, I can read the quote and that will help me get into the zone for writing that project. I then set myself both micro and macro deadlines for each project. And remain flexible within those deadlines should other opportunities arise. And most importantly, I never stop. Public holidays and weekends? What are they? I’m definitely not advocating my approach as the only approach to writing. There are many who would argue that I would benefit from focusing solely on one thing at a time. But that’s just not how I work, or how I enjoy working. I get a kick out of working on multiple things at the same time, and feel that the stress of it makes me work better. What are your writing habits? What are you doing each day to advance your screenwriting career? This entry was posted in Advice, Feature Films and tagged Craig Mazin, filmmaking, John August, Joss Whedon, Lawrence Kasdan, Neil Gaiman, screenwriting, Scriptnotes, scriptwriting, writing. Bookmark the permalink.